I thought it would be a fun idea to interview a friend and fellow blogger. She’s a very talented writer and general all round brilliant person. I have no problem in sharing her blog because we write about completely different things, but even if we didn’t I’d still sing her praises. How did we become friends? A few years ago we both worked for a small company with a team of 4. We immediately hit it off as friends. We not only worked in the same place but we both had an interest in blogging. Although we are very different in lots of ways, when we both moved on from that place.. we kept in touch and became closer than every. Which is really cheesy, but oh so true. We do so much together including exciting things we can blog about: ice skating, attending concerts and shows, day trips and exploring. I started my blog a few years ago because I wanted to be more creative and wanted my own little space on the internet like my own little diary where I could share my thoughts and ideas. Then over time it has evolved and it encouraged me to go out and do new things, try new things and share my experiences. It has taught me to live more. So now, my blog is all about the exciting things I do and the amazing places I visit. I hope it inspires people to get out there more. Where is your favourite place to write a blog? Coffee shops!Every since I lived in London I have loved visiting coffee shops on my own so i can people watch which is really inspiring and thought provoking. It is nice to be surrounded by people without necessarily having to interact. So I can feel like I have got company, even when I want time on my own… and obviously a nice cup of coffee helps. How long does it normally take you to write a blog? Normally an hour? it depends on what i write to be honest. If its about a place then i like to research the history of it before hand so that can take a while. It takes a lot of time to upload my travel holiday photos though .. but I want to get it just right. Favourite places you’ve been that you’ve blogged about? a couple of years ago i did an adventure holiday to Iceland, Canada and New York. I had so much to say about all 3 places that I ended up doing a mini series of 3 blogs, one for each location. It is hard to pick a favourite but i would say my favourite place so far has been Iceland. I have already been twice~! and there is a lot to love about it. 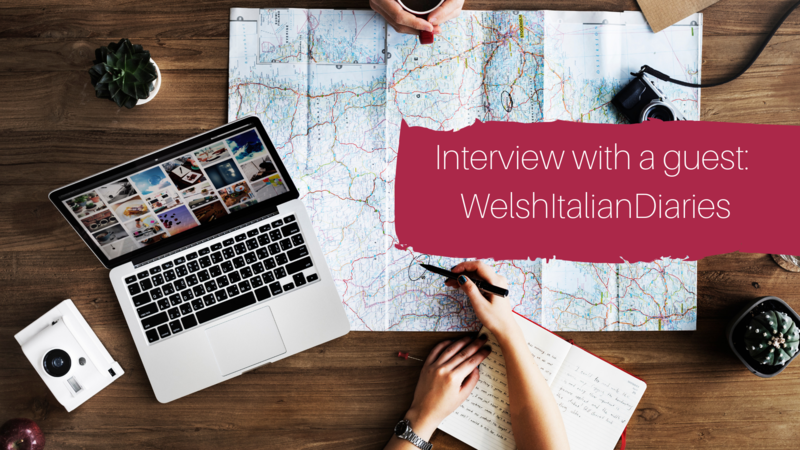 Seeing as I am The Welsh Italian diaries… I have to mention Italy. I did a blog about Cinque Terre. The 5 famous Italian villages on the coast. It’s a huge contrast to Iceland in many ways, not just the weather but the food and the culture too, and as much as I love Iceland, Italy will always hold a special place in my heart. If you are looking for a sunny holiday, definitely go to Italy. If you’re looking for a winter holiday then id recommend Iceland. Name some places you’d like to visit that you could blog about? I’ve recently been to Croatia and I’m yet to write my blog about it. It was somewhere I wanted to visit for a long time and it was such an inspiring trip because there is a lot of culture and history which fascinates me, and we also got a change to visit Bosnia and Herzegovina which is probably not somewhere I ever would have visited before. We packed loads into the trip, so i have lots of exciting stories to tell. As for places I’d like to blog about; I have made it my new years resolution to visit Asia this year. I really want to see a new continent and experience an entirely different culture. So I have been daydreaming about visiting Sri Lanka, Bali and Thailand. Have you had any exciting experiences just because of your blog? and I went canoeing on the river Wye. Do you see yourself as always been a travel blogger, and if so where would you like it to take you in the future? I think i will always love writing about places and experiences i have. So i think my blog will always revolve around travel as one of the key themes. Recently i have also found it to be a really good way to share other things i am passionate about as well. Although its primarily an adventure type blog, i also write about things that are close to my heart like mental health. In the future I will continue writing about places i visit and i would absolutely love to be a travel writer who gets to travel the world and write about it creatively to inspire others to see the world. It would be my dream job. If you were to start all over again, and travel and adventure blogging was not an option, what else would you love to focus a blog on? I would probably write about food. I am a foodie! But I’m \not very good at cooking. Id love to be a food critic writing about what I recommend. But i would love being paid to eat. So, lets get more personal tell me some funky *FUN.KEY* facts about you (that I can share on my blog) ? I was brought up in Wales but my family still has a lot of Italian traditions. In particular, lots of people think its weir, but we don’t have turkey for christmas dinner. i have come a long way since there. Now i love live music and try to go to as many concerts and festivals as i can. 5. This is really hard… ummmmmmm… help. So I love doing active things like rock climbing . I started climbing when I was in uni and it is a really good way of keeping fit, socialising and taking some time out. You really have to focus on what you’re doing and its a good challenge. I have also climbed a mountain in Snowdonia, Idwal Slabs. Do you have any advice for someone who wants to start a blog but doesnt know where to begin? Thanks Danielle for featuring on my blog! Heres a pic of use today having coffee in 200 Degrees in Cardiff on a VERY rainy day.